You are here: Home » MEDIA » Books » Give Me These Moments Back by Mike Chinn (book review). 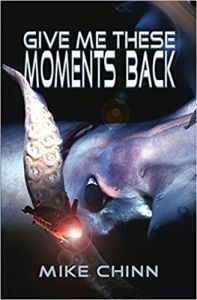 Give Me These Moments Back by Mike Chinn (book review). Mike Chinn is a Birmingham-based author who has been publishing short stories since 1974. He has also done a fair amount of editing and written numerous graphic novels. This book is a collection of short stories from various phases of his career, but all written since 2000. The book is positioned as horror but I am uncertain this is entirely true. It has an interesting cover illustration which I suspect to be one of those cunningly wrought multiple exposure photographs such as Jack Potter’s cover for Cradle Of Filth’s ‘Midian’ album. The image seems to nicely illustrate the opening story ‘Welcome To The Hotel Marianas’. Chinn is clearly fond of burying literary or lyrical references in his stories. This reviewer is ashamed to admit that he did not spot all of them on my read-through but a helpful ‘Afterward’ provides notes on such for the curious. This is perhaps indicative of my overall problem with these stories. If anything, Chinn’s writing is sometimes a little too subtle. Many of the stories read as very straightforward drama right up until the last page when the horrific twist is revealed. Certainly, Chinn finds horror in the juxtaposition of the casually terrifying overlaid against mundane reality. However, the twist is often only insinuated and I am not sure that I managed to get all of them. Alas, some of the tools and techniques Chinn employs contrasts with my sense of disbelief. The first three stories are a case in point. These are the above mentioned `Marianas’ as well as ‘Facades’ and ‘A Matter Of Degree’. These concern respectively sub-aquatic monsters, getting supernaturally lost in Venice and an attempt to gain a form of immortality that becomes a misadventure. Although all three are quite different, all end with no survivors. So my natural though process wonders, who then was left to tell the tale? Maybe this is not a problem for some readers as there are some glowing reviews on Amazon but, for myself, I tend to dislike this as it feels illogical which cancels any sense of horror that I can discern. Moving on through the volume, we certainly find a great variety in the stories. ‘All Under Hatches Stow’d’ exploits the natural horror that we all might feel about Ebola and flesh-eating-virus outbreaks that have popped up in the news or urban legend in the last decade or so. ‘Be Grateful When You’re Dead’ is a satire on the music industry and is almost more humorous than horrifying. ‘Kami Ga Kikoemasu’ references traditional Japanese monster movies and protests Japan’s continuing whaling industry. All these tails work as far as they go. Chinn writes very precisely with the necessary economy of description that an effective short story requires. The stories feel professional and at the same time quite odd and quirky which fits Chinn’s aim to insinuate horror well. However, this reviewer would perhaps like a bit more to go on as sometimes implication feels insufficient. For example, in ‘Kami Ga Kikoemasu’, I would have liked more description of the actual monster and maybe a sense of its history. The first story I really enjoyed was ‘All Beauty Must Die’. Chinn’s notes inspiration from the Germanic Myth of the Dwarf-King Laurin and the Princess Simult but I identified more references to Oberon of ‘A Midsummer Night’s Dream’. It’s probably a good fit for a satire on the beauty industry either way. I liked the almost modern urban fairy-tale nature and I really got the timeless beauty theme. By comparison, I could not enjoy ‘Parlour Games’, which is a Victorian unreliable-narrator tale. I’m sure the story would be effective for a reader who meshes well with this style but I could just not put myself in the narrator’s position. As an aside, I have always been most comfortable with the works of Isaac Asimov for whom most stories feature narrator-driven tales of crystal clarity and perfect reliability. ‘Cold Rain’ was another story that I felt was too insinuated and not deeply explored enough. Chinn admits he was writing in the style of his friend, the late Joel Lane. I’m not sure I properly understood the ending, which is obviously essential to feeling the horror. As the meaning might have been obfuscated for me it just made me mildly uncomfortable. The next tale I’m not even sure really is horror. ‘Once Upon An Easter’ is basically a spaghetti western and it felt a little out of place amongst the others, deeply varied though they may be. There was a vaguely supernatural element, so maybe it does belong here but I felt it didn’t horrify me. Ah well. ‘The Appalachian Collection’ was a bit better and unusually for these tales invoked a good sense of foreboding. I liked the Addams Family feel of the hotel and felt the characters were portrayed to a more complete standard than the other stories. It also felt curiously dream-like, although the twist at the end felt so slight that once again I wasn’t sure I understood it. A nicely crafted story, though. Chinn returns to his city of residence for the next tale ‘Just The Fare Back Home’. This is a quick blood-and-thunder play on Brum’s homeless residents in an almost Ripper-style. A dash of ice-water after the previous few stories. ‘Harbour Lights’ as actually an SF story (woooo!) and describes a quick whodunit in a quite literal underclass of people living under an installation of galactic empire landing pads and scavenging the detritus of the cast-off refuse from above. It is an odd tale where the SF stood out a bit more than the horror for me. ‘Give Me These Moments Back’ repeats the same issue. Although shorter, it fails to foreshadow the twist and that twist is insinuated so that this reviewer kept re-reading it to see if I had got it right. A bit more clarity please! ‘Brindley’s Place’ is a Birmingham-based crime noir tale. It is well-crafted with more nicely portrayed characters as well as having a cheeky title to anyone familiar with Brum. Again, the horror was not very apparent, so my notes for ‘Once Upon An Easter’ could be repeated here. This tale worked and provided variety, as if these tales needed any more of that, but doesn’t feel like horror. The volume closes with two further tales, the first of which is probably the nastiest and most realistically horrifying and the second, an outright fantasy jaunt. ‘Holding It In’ is the diary of a particularly evil character that is in the process of an all too realistic crime the likes of which have made national news in both the UK and the USA. There are no supernatural forces here just a thorough description of evil. Most effective. Also most effective is ‘Saving Prince Romero’. This is great fun little fantasy adventure in a slightly pre-renaissance feeling fantasy kingdom. Chinn has great fun writing his three protagonists and the adventure doesn’t feel like it belongs in the same collection as ‘Holding It In’ but I am glad it is here as the volume ends on a fun high-note. Chinn’s own comments note ‘I must revisit this decidedly non-PC trio someday’ and he’s right about that. More please! Overall, I did enjoy the high points ‘All Beauty Must Die’, ‘The Appalachian Collection’, ‘Holding It In’ and ‘Saving Prince Romero’ but all for completely different reasons. Chinn writes with a varied and often effective voice but just not always to this reviewer’s taste or sensibilities. The stories are probably aimed at the kind of fan whose suspension of disbelief is not destroyed by the faults I have mentioned. If you don’t have a problem with a lack of survivors or unreliable narrators, then you might find a greater sense of enjoyment from these stories. However, I suspect many readers will find that many of the stories do not sufficiently explore the horror. If this is so, then this will sadly remain a rather niche book. « Star Trek Discovery: the Klingons are coming!